The best referral program we’ve seen—generates 16-50 new clients a month. STEP 1: An existing client invites a friend to try your salon, by extending to them a $20 credit toward any service they have not yet tried. STEP 2: When the friend comes into the salon to use it, the referring guest then receives a $25 salon credit toward product purchases. It lets them extend a special deal to their friends. They have less doubt about patronizing an unfamiliar business if a trusted person has recommended it. The $20 credit is significant enough to persuade them to use it. It’s easy to measure results. 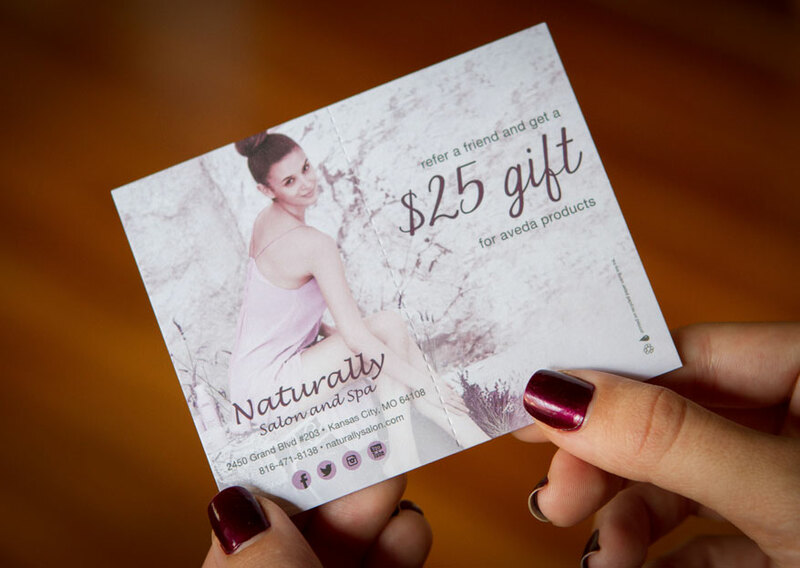 The $25 product voucher encourages upsells and crossover to new products. For Aveda salons, it’s eligible for Aveda Concept Benefits. It is successful even without staff involvement (dropped into retail bags). It helps fill their books — especially important for New Talent. The 20/25 ratio. Market research shows that of all the various figures tested for this program, the 25/20 ratio generated the most success for salons and spas. It’s a significant enough gift to entice both new and existing guests, but not enough to hurt your bottom line. Rewards your new guest with services and your existing guest with products. You want your referred clients to get a great service at your salon — this is more likely to bring them back. A discount on products alone might result in a loss to your salon without giving them an incentive to become a guest. Your existing guest is already getting services, so this isn’t a concern. The $25 is for products at retail price (not salon cost, therefore the loss to you is lower) and the retail ticket is often more than $25, plus it’s for products they may be new to trying. Guests are also more likely to book services again now that they’re back in to see you to redeem their product voucher. 3. Email the referral card to your client list. 4. Take it Online— Offer the referral card on your website and Facebook Page. Need help implementing? Call Imaginal Marketing; they perfected the program and they’ll set you up with all the pieces above.